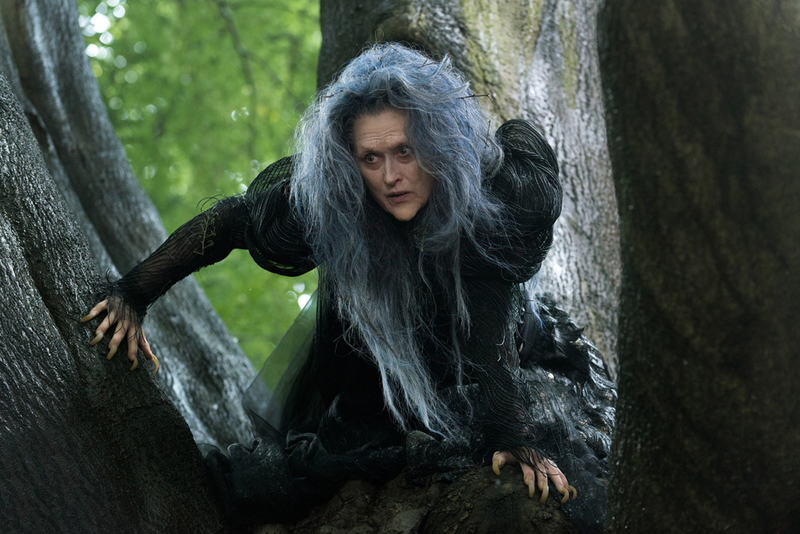 Watching Into the Woods on the silver screen should be breathtaking. Fairy tales come to life! Into the Woods is entertaining until two-thirds into the movie, when everything turns very dark, literally and figuratively. But is the stage version any different? Is the movie a faithful adaptation of Stephen Sondheim’s fairy tale mash-up? Disclaimer: A copy of the movie was given to me by the distribution company for review. My opinions are my own. Into the Woods [This is an affiliate link. I will make a small commission if you purchse through this link.] went to great lengths to create a fairy tale world, using tons of dirt and truckloads of trees to build a set. The musical was filmed in parts of the United Kingdom, which is the perfect setting for fairy tales, with its lush, green grass and foliage, as well as its grand castles and estates. However, Into the Woods still came across like a play that was being recorded on video, rather than a film in its own right. The performances were slightly more grounded than you would see in a stage version (the camera allows for much more natural, nuanced performances). But Into the Woods found itself stranded in a no man’s land between the broad strokes of a stage musical and the intimacy of film. It flounders somewhere in the middle. I wish Rob Marshall had made a clearer choice between over-the-top, like Johnny Depp’s portrayal of the Wolf, or intimacy, like Meryl Streep’s “Stay With Me” as the Witch. Into the Woods was, perhaps, too faithful to the musical, which is why it couldn’t completely break the confines of the stage. But there were also plenty of differences between the two versions, differences that left me scratching my head. A few things were cut or altered for seemingly no reason. 1. Rapunzel didn’t die. In the stage version of Into the Woods, Rapunzel gets smooshed by the giantess when she runs away from her mother, the Witch. But in the movie version, she merely runs away with her prince. It makes no sense to change Rapunzel’s fate. In fact, her daughter’s death should be the catalyst for every move the Witch makes for the rest of the show. Without the pain of her child’s death, the Witch didn’t have much of a character journey; she had nowhere to go. And her song, “Children Will Listen,” lost a lot of the yearning it should have had. She wasn’t any more or less evil when she disappears, at the end, than she was in the beginning. 2. The Baker didn’t sing “No More.” In the stage version of Into the Woods, the Baker’s big song, “No More,” comes when he is at his lowest. It is a gorgeous song, a typical Sondheim song, full of pain and regret and defeat. But, it is a duet between the Baker and his father, the Mysterious Man, who was completely cut from the movie. I can’t help but think that somehow “No More” could have been worked into a beautiful solo. Poor James Corden was robbed of his star scene. Director Rob Marshall has said that the song was cut because too many ballads were slowing down the last act. Frankly, that third act was a drag anyway. (Could they have stumbled around the same damn trees in the dark any longer? How about a nice clearing with a brook? Or a hillside? A big boulder? Anything?) I would have relished a break from the woe-is-me vibe of the whole group by listening to Corden’s lovely tenor voice at its fullest. Plus, “No More” takes the Baker from utter hopelessness to fierce determination. The short spoken scene in the movie just didn’t have the same effect. 4. The Wolf and Cinderella’s Prince were played by two different people. In the stage version, the Wolf and Cinderella’s Prince are played by the same actor. Do you see the message? Both characters prey on an unsuspecting female. The casting is supposed to reflect the base nature of Cinderella’s Prince, regardless of his royal status. But in the movie, two different gents play the parts (Johnny Depp and Chris Pine). Perhaps they didn’t want to confuse the audience. If that’s the case, it’s rather insulting. If we can accept that all of Metropolis is fooled by Clark Kent’s glasses in Superman movies, I think we can figure out that Cinderella’s Prince isn’t some kind of werewolf. Or, perhaps they wanted to recruit more star power for Into the Woods. Regardless of the reason behind the decision, another small piece of clever storytelling was lost in the movie version. Into the Woods is enjoyable for the first two thirds of the movie, but everything comes to a grinding halt for the last third. I wish (see what I did there?) they had changed the setting, or pulled back to a wider shot, or kept the Baker’s song, to make that last third moving. At the very least, if you haven’t seen Into the Woods on stage, seeing the movie will most likely spur you to seek out the video recording of the original cast, or a stage production somewhere near you. Thanks for reading! Which scene is your favorite? Tell me in the comments! wow you didn’t mention the narrator!